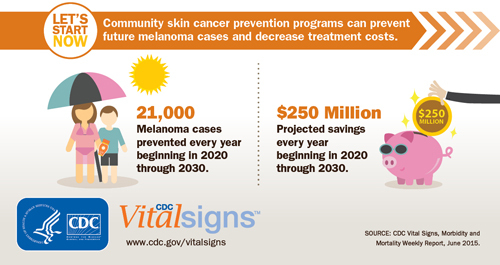 Community skin cancer prevention programs can prevent future melanoma cases and decrease treatment costs. Melanoma rates doubled between 1982 and 2011 but comprehensive skin cancer prevention programs could prevent 20 percent of new cases between 2020 and 2030, according to this month’s Vital Signs report. Skin cancer is the most common form of cancer in the U.S., and melanoma is the most deadly type of skin cancer. More than 90 percent of melanoma skin cancers are due to skin cell damage from ultraviolet (UV) radiation exposure. Melanoma rates increased from 11.2 per 100,000 in 1982 to 22.7 per 100,000 in 2011. The report notes that without additional community prevention efforts, melanoma will continue to increase over the next 15 years, with 112,000 new cases projected in 2030. The annual cost of treating new melanoma cases is projected to nearly triple from $457 million in 2011 to $1.6 billion in 2030. This Vital Signs report shows that melanoma is responsible for more than 9,000 skin cancer deaths each year. In 2011, more than 65,000 melanoma skin cancers were diagnosed. By 2030, according to the report, effective community skin cancer prevention programs could prevent an estimated 230,000 melanoma skin cancers and save $2.7 billion dollars in treatment costs. Successful programs feature community efforts that combine education, mass media campaigns, and policy changes to increase skin protection for children and adults. Researchers reviewed data from CDC’s National Program of Cancer Registries and the National Cancer Institute’s Surveillance, Epidemiology and End Results Program (SEER) to help determine the increase in melanoma rates. This Vital Signs report highlights the recommendations for communities from the Community Guide for Preventive Services. Communities can increase shade on playgrounds, at public pools, and other public spaces, promote sun protection in recreational areas, encourage employers, childcare centers, schools, and colleges to educate about sun safety and skin protection, and restrict the availability and use of indoor tanning by minors. Everyone is encouraged to protect their skin with protective clothing, wide-brimmed hats, broad-spectrum SPF sunscreen, and seek shade outdoors. Through the Affordable Care Act, more Americans will qualify to get healthcare coverage that fits their needs and budget, including important preventive services. Behavioral counseling is now provided with no cost-sharing to counsel people aged 10–24 years with fair skin about limiting their exposure to UV radiation to reduce risk of skin cancer. Visit Healthcare.gov or call 1-800-318-2596 (TTY/TDD 1-855-889-4325) to learn more. To learn about CDC’s efforts to prevent skin cancer, visit: www.cdc.gov/cancer/skin. Vital Signs is a report that appears on the first Tuesday of the month as part of the CDC journal Morbidity and Mortality Weekly Report. The report provides the latest data and information on key health indicators. These are cancer prevention, obesity, tobacco use, motor vehicle passenger safety, prescription drug overdose, HIV/AIDS, alcohol use, health care-associated infections, cardiovascular health, teen pregnancy, and food safety.